With less than a month to go before the 2016 Presidential elections, the attention of the US and the world is focused on the policy platforms the candidates present. Despite the intense 24-hour coverage of the election, the Arctic, and the issues affecting it, have had little coverage dedicated to them from the media and the campaigns. In one way, this is unsurprising, given that there are issues of greater salience for American voters, like the economy, and given that Alaska, America’s Arctic state, accounts for only 3 electoral votes, which have gone to the Republican candidate without fail since 1964. However, the difference between Clinton and Trump on issues of environmental policy, energy policy and Arctic development are so different that the Arctic has as much at stake in the 2016 election as any other region worldwide. When Americans go to the polls on 8th November, they will be voting on two divergent directions for the Arctic’s future. This article will assess the implications of a Trump Presidency on the Arctic, examining his campaign’s positions on the environment, energy policy, Arctic drilling, and security issues. The article demonstrates that while a Trump Presidency would focus on the pursuit of energy independence through the development of domestic resources, this may come at the expense of addressing the Arctic’s most pressing challenge – climate change. It is now held by the majority within the scientific community that the world is subject to rising temperatures related directly to global carbon-dioxide production. The rising temperatures are felt at their most extreme at the world’s poles, where warming is estimated at twice the rate of the rest of the world (National Oceanic and Atmospheric Administration 2015). This makes the Arctic very much ground zero for climate change, with its effects already being shown within the region. In 2015, the mass of Arctic Ice was shown to be the 4th lowest on record (National Ocean and Atmospheric Administration 2015). The impact of warming has already been shown to change Arctic ecosystems and weather systems, and has led to climate refugees in the region (Bronen 2015). Continued Arctic warming would have global ramifications, including predicted changing sea currents and increasing global temperatures. Comprehensive efforts are required to address global warming and mitigate the effects it is already having in the Arctic. President Obama has looked to do so during his tenure, committing America to a domestic and global framework to cut carbon emissions. However, faced with an obstructive Congress, much of Obama’s climate agenda has been pursued using his presidential powers. Going forward, this means that many of the efforts that Obama has taken to protect the climate will be dependent upon his successor continuing such work, which could also be undone with relative ease. Against the weight of scientific studies and opinion, Donald Trump has frequently expressed skepticism about climate change. The issue has not been raised extensively on the campaign trail; however, views expressed by Trump on Twitter, or occasionally during interviews and rallies, highlight his views on the issue. A word commonly used by Trump in relation to climate change is ‘hoax’, as he did during a rally in South Carolina in late 2015 (Zoroya and Rice, 2016). As The New Yorker reports, he is also known to have decried climate change as a “canard”, “non-existent”, a “make-believe problem”, a “big scam”, and a “very, very expensive form of tax”. At times, Trump’s views on the issue have been comical, suggesting that climate change as an idea had been “created by the Chinese” in order to make US business less competitive (Trump 2012). That he denied having said so when Hillary Clinton brought it up in the first Presidential debate did not distract his opponents from that 2012 tweet that was also brought up by Bernie Sanders and the Fox News program ‘Fox & Friends’ earlier in 2016. Trump has used cold weather and snowfall in America to challenge climate science previously, suggesting that record low temperatures in December 2010 should make climate activist Al Gore return his Nobel Prize gained for his work on climate-related issues (Koch, 2010). Trump has not served in political office and, thus, has no record on climate change to examine; however, his pick of VP nominee is also symbolic of the ticket’s position on the environment. Trump’s VP pick, Mike Pence, reaffirms the climate-sceptic position of the Trump campaign, given his position on climate change. Pence, throughout his career, has made a number of statements highlighting his rejection of climate change; and under his Governorship, Indiana legally challenged Obama’s Clean Power Plan. Pence has since stated that even if the court was to rule in favour of the President’s plan, Indiana would reject the conditions (Foran, 2015). Environmentalists have good reason to worry about the prospect of a Trump Presidency. Were Trump to be elected, he would gain the dubious distinction of being the only world leader to deny climate change. Jeremy Symonds, senior adviser with the Environmental Defence Action Fund, is astounded at Trump’s decision to “debunk climate science even though climate is likely the most thoroughly researched area on record” (Zoroya and Rice, 2016). In recent weeks, Trump’s campaign has looked to step back from its outright denial on climate change, with Trump himself stating that it needed to be ‘investigated’ (Cama, 2016). Such statements, likely attempts to avoid Trump’s previous denial of climate change, are becoming an issue in the campaigns, as this could limit his appeal to undecided voters. A recent survey by the Scientific American has found that increasing numbers of Republicans accept climate science and, thus, being in outright opposition to climate change would be bad for party branding (Lehman, 2016). Trump may, going forward, look to hedge on the issue, and suggest support for research, though this is likely an attempt to secure more votes. A Trump Presidency on issues of the environment and energy would operate under high levels of scepticism on climate change, if not in complete rejection of it. If elected to the Presidency, across the board, Trump would likely look to remove initiatives designed to cut carbon emissions. This has been outlined in Trump’s energy plan in which it states that regulation contrary to the national interest or the interest of American workers will be scrapped (Trump 2016). Trump has been critical of the red tape of environmental restrictions, which he believes stifles business and job creation. Obama’s Clean Power Plan is one such initiative that has already been rejected by Trump. While the plan is currently working its way through the courts, Trump has stated that regardless of any rulings, he will rescind the plan (Trump 2016). The Clean Power Plan has been described by Trump as part of Obama’s ‘War on Coal’, which he has stated would remain a major part of American fuel production were he to become President (Trump 2016). Trump has also taken aim at the Environmental Protection Agency, claiming that he would abolish the agency entirely or drastically scale back its power. Such a move, during the campaign season, ticks a box with Conservative voters, as it shows Trump looking to roll back regulations. Trump has described the body’s taxes as totalitarian, while also proposing to remove any US taxpayer funding for UN attempts at mitigating climate change. It is legally nigh impossible to cut the EPA in its entirety as this would require a rewriting of US environmental laws (Milman 2016). While Trump’s statement shows he may not be au fait with the legal restrictions that prevent him from scrapping the EPA, it is enlightening with regards to his viewpoint on environmental regulations. Trump would take aim at environmental regulations were he to become president, and while he may not be able to change the EPA, the commitment to this agenda is clear in Trump’s rhetoric on the subject. One of Obama’s signature climate policies has been the international agreement in Paris, adopted by consensus in December 2015 and with the threshold for entry into force achieved in October 2016. This agreement commits the US to curb its carbon emissions to 2005 levels by 2025. Trump has always opposed the Paris Agreement, promising to cancel US participation completely (BBC News 2016). There are some obstacles that would prevent Trump from scrapping the deal, were he to be elected. As the deal has already been signed by Obama, its conditions will come into play prior to the new President taking office. Within the deal, there is a 3-year wait before a signatory can remove their consent to the conditions, and another year after this before they can leave the agreement. However, despite the efforts put in to getting the agreement, one of its conditions is that it is not binding, and the penalty for not following the rules is simply having to give reasons for the non-compliance. Such a decision would also likely lead to other states defaulting on their commitments, and the Paris Agreement promoted as the great hope to prevent global climate change would thus crumble. The mainstay of Trump’s energy policy is working to establish energy independence by developing indigenous resources and creating jobs within the energy sector (Trump 2016). Trump’s campaign has looked to frame him as a champion of energy workers and a supporter of fossil fuel industries. The commitment to cutting environmental regulation and developing domestic resources would pave the way for increased exploration and lease-granting in the Arctic. This position is popular with many of the electorate, as it proposes to reduce American reliance on imported oil from the Middle East. Trump has stated repeatedly that he wants to reduce American reliance on the ‘OPEC cartel’ and develop resources within America (Hislop 2016). He has previously criticised Obama for taking ‘huge percentages of Alaskan petroleum off the table’ (Martinson 2016), despite Obama granting leases for Arctic exploration, and the likelihood that they will be included within the 2017-2022 Outer Continental Shelf Program, as was illustrated by a recent draft from the Interior Department (DOI.gov 2016). Trump has a vocal supporter in Sarah Palin, Alaska’s former Governor and known advocate of Alaskan drilling; and while sharing the stage together at an event in 2015, Palin enthusiastically led a ‘drill baby drill’ chant (Herzog 2016). Extended drilling in Alaska would be popular for many within the state, given that it would create many employment opportunities in one of America’s most impoverished states. Alaskan unemployment is the highest in the United States at 6.7%, and the region has a number of societal issues like high levels of alcoholism and high suicide rates, which of course can be linked to low employment opportunities (Bls.gov 2016). Creating jobs in the energy sector and pursuing American energy independence would both be done through expanding Arctic drilling, granting more leases and removing environmental restrictions that prevent such efforts. With increased exploration comes greater risk of oil spills with which the Arctic is currently ill prepared to cope. Dealing with an oil spill in the Arctic could mean travelling to remote areas to clear up the problem, and there is currently little capacity to deal with such an event. Presently, the Coast Guard, along with the National Oceanic and Atmospheric Administration, run monthly expeditions to carry out equipment tests and examine their capability with regards to cleaning up and oil spill; yet, these tests frequently identify faults in equipment and the difficulty of carrying out clean-up operations in the High North. Trump’s opponent, Hillary Clinton, believes that extending Arctic drilling is too dangerous, splitting from Obama and his granting of leases for exploration to rule out further Arctic development (Eilperin 2016). Trump has stated previously that when oil spills occur, you ‘clean them up’. Whilst such spills present immediate, widespread and lasting environmental damage in the Arctic, given Trump’s preference for developing domestic resources, it is unlikely that damage would persuade him to change his view. Trump has said little specifically regarding Arctic challenges and, thus, has not addressed questions regarding Arctic security and future Arctic exploration. Future Arctic issues like contestation over resources will be a major feature of Arctic politics over the coming years, and there is no indication of how Trump would respond to them. Trump’s statements on securing oil resources in the Middle East suggest that he would have no issue flexing American military muscle to secure Arctic resources. However, recent statements about President Putin of Russia suggest that a greater amount of cooperation across the board could occur, were Trump to win the presidency. It is difficult to speculate on such matters, given the lack of coverage of these issues by the campaigns. Examining the future of Arctic relations under Trump would thus rest on an interpretation of his ability to conduct statecraft in an informed and consistent manner. During the campaign, many consider that Trump has not exhibited the qualities of statecraft; and were he to become President, it is not clear how he would interact with other Arctic states on the region’s major issues. It is likely that Arctic states, particularly the US’s NATO allies, would feel less secure about American support in the Arctic, given what Trump has said on the alliance previously. As Obama’s administration looked to build on relations with Arctic states during the White House Arctic Science Ministerial last month, the first of its kind, it is likely that this momentum and progress made between Arctic states would be squandered under Trump. One of the primary aims of the ministerial meeting was to establish greater scientific cooperation, and clearly given that Trump rejects climate science, the potential for increased cooperation in this regard is limited. Donald Trump, as President, would not address the major environmental challenges currently present in the Arctic. Trump would hack away environmental restrictions and promote continued fossil fuel use and extraction in America to pursue energy independence. While his position of developing fossil fuel resources will be popular with some of his electorate, these developments would come at a major risk in terms of oil spills. Trump cannot, without Congress, authorise exploration in designated wilderness areas in Alaska; however, other areas like the Chukchi Sea would likely see more developments. Global initiatives to counter climate change will fail without US leadership, and the Arctic climate without these efforts will continue to drift towards irreversible change. BBC News. (2016). Donald Trump would ‘cancel’ Paris climate deal – BBC News. [online] Available at: http://www.bbc.co.uk/news/election-us-2016-36401174 [Accessed 17 Sep. 2016]. Bls.gov. (2016). Unemployment rate highest in Alaska, lowest in South Dakota in June 2016 : The Economics Daily: U.S. Bureau of Labor Statistics. [online] Available at: http://www.bls.gov/opub/ted/2016/unemployment-rate-highest-in-alaska-lowest-in-south-dakota-in-june-2016.htm [Accessed 16 Sep. 2016]. Doi.gov. (2016). Interior Department Announces Next Step in Offshore Oil and Gas Leasing Planning Process for 2017-2022. [online] Available at: https://www.doi.gov/pressreleases/interior-department-announces-next-step-offshore-oil-and-gas-leasing-planning-process [Accessed 16 Sep. 2016]. Eilperin, J. (2016). Hillary Clinton breaks with Obama to oppose Arctic drilling. [online] Washington Post. Available at: https://www.washingtonpost.com/news/energy-environment/wp/2015/08/18/hillary-clinton-breaks-with-obama-to-oppose-arctic-drilling/?utm_term=.5b3905cf7ec5 [Accessed 16 Sep. 2016]. Foran, C. (2015). Mike Pence Says Indiana Will Buck Obama’s EPA Climate Plan. [online] The Atlantic. Available at: http://www.theatlantic.com/politics/archive/2015/06/mike-pence-says-indiana-will-buck-obamas-epa-climate-plan/443658/ [Accessed 16 Sep. 2016]. Herzog, K. (2016). Sarah Palin endorses Donald Trump, resurrects “drill, baby, drill” theme. [online] Grist. Available at: http://grist.org/article/sarah-palin-endorses-donald-trump-resurrects-drill-baby-drill-theme/ [Accessed 19 Sep. 2016]. Hislop, M. (2016). 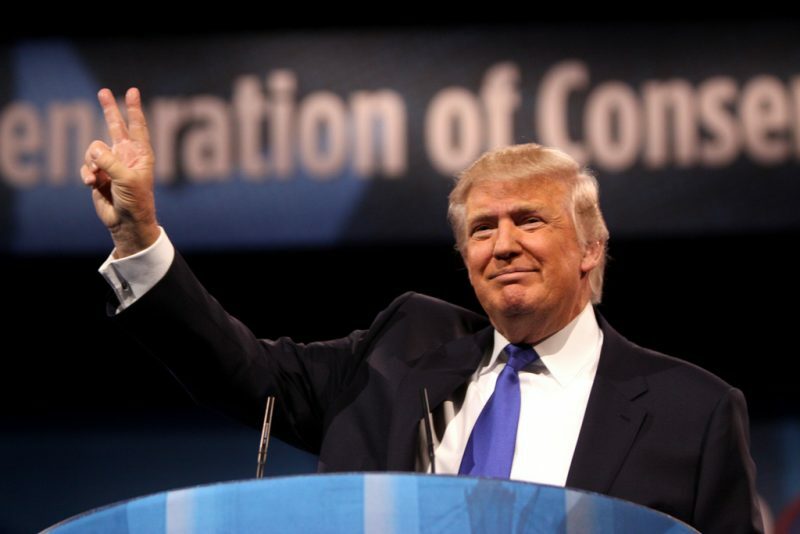 Donald Trump pledges to punt OPEC oil from American market – The American Energy News. [online] The American Energy News. Available at: http://theamericanenergynews.com/markham-on-energy/donald-trump-pledges-ban-opec-oil-american-market [Accessed 16 Sep. 2016]. Lehmann, E. (2016). Many More Republicans Now Believe in Climate Change. [online] Scientific American. Available at: http://www.scientificamerican.com/article/many-more-republicans-now-believe-in-climate-change/ [Accessed 16 Sep. 2016]. Martinson, E. (2016). Trump energy plan calls for more drilling, fewer environmental protections. [online] The Independent Barents Observer. Available at: http://thebarentsobserver.com/arctic/2016/05/trump-energy-plan-calls-more-drilling-fewer-environmental-protections [Accessed 19 Sep. 2016]. Milman, O. (2016). Republican candidates’ calls to scrap EPA met with skepticism by experts. [online] the Guardian. Available at: https://www.theguardian.com/environment/2016/feb/26/republican-candidates-donald-trump-eliminate-epa-law-experts [Accessed 19 Sep. 2016]. National Ocean And Atmospheric Administration, (2015). Warmer air and sea, declining ice continue to trigger Arctic change. [online] Available at: http://www.noaanews.noaa.gov/stories2015/121515-arctic-report-card-warmer-air-and-sea-declining-ice-continue-to-trigger-arctic-change.html [Accessed 16 Sep. 2016]. Trump, D. (2016). America First Energy Plan. [online] North Dakota. Available at: https://www.donaldjtrump.com/press-releases/an-america-first-energy-plan [Accessed 16 Sep. 2016]. Zoroya, G. and Rice, D. (2016). Clinton, Trump show stark contrast on climate change. [online] USA TODAY. Available at: http://www.usatoday.com/story/news/politics/elections/2016/2016/08/02/donald-trump-climate-change-hillary-clinton/87628818/ [Accessed 16 Sep. 2016].